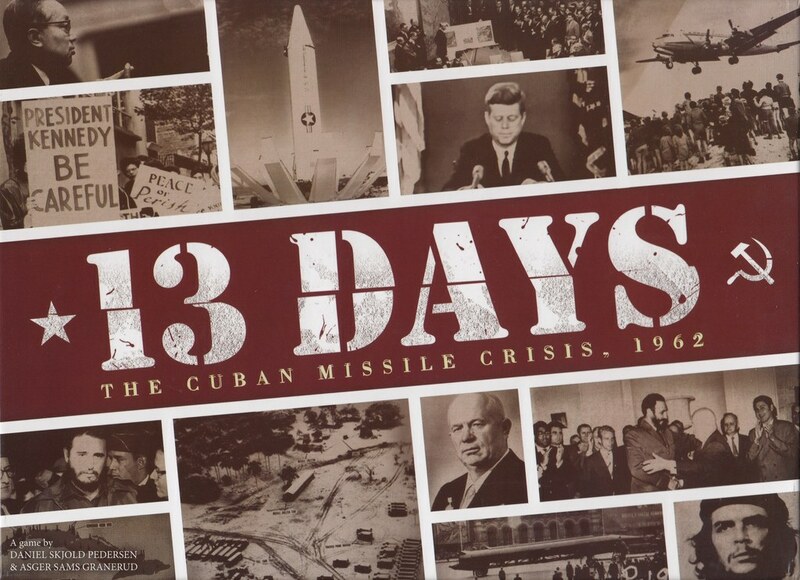 13 Days is a game about getting through the Cuba Missile crisis without starting a nuclear war. It is a game about coming out on top in the world opinion after the crisis and it is a game of clever timings and bluffing. What does 13 Days feel like? At its core 13 Days is a card game where you play one card each turn. This card lets you place cubes on a map, symbolising your influence in that area. What creates the tension in this game is a clever mix of hidden information and cards that can be used in different ways. But before we get into that we need to look at the overall structure of the game. 13 Days takes place over only 3 rounds. At the end of these rounds the player with the most prestige wins. To gain prestige you must complete your secret agendas. At the beginning of each round you draw 3 agendas and mark all of them on the board. But you only select one of them. Thus, your opponent knows that you try to have most influence in one of these three areas, but not exactly which one. So, we have a game where you play a card and use it to gain influence in an area where you want to win, but don’t want your opponent to know that you want to win. You must add three significant twists to grasp the game. The first twist is that the cards have two different effects, they can be played for a cube value that allow you to plain and simple place a set amount of influence cubes on one spot on the board. The other way to play a card is for its effect. This might be placing cubes on two different areas. But, and this is where the second twist comes in, there are three categories of cards: USA, USSR and UN (neutral). You can only play your own faction’s and the neutral faction’s cards for the effect. The other side’s cards, you must play to put cubes on the map, and when you do so, your opponent gets the effect. With a small hand of cards, this means that the order of the cards you play is of uttermost importance. Using an opponent’s faction’s cards at a moment where she can’t use its effect is a big part of the game. The final twist is that the game can end after any round. Either or both of you can lose the game at that point. To avoid this you must both manage the DEFCON thread level in a timely manner. And that can be a really challenging thing as almost everything you do influences the DEFCON track. This is both a strength and a weakness of the game for me. It adds a lot of strategy and tension to the game. It is however also really anticlimactic to win because your opponent didn’t manage their side of things well. But it fits well with the theme and isn’t a big issue if you play with people who know the game well, but I often play with new people in my two player sessions. 13 Days is really a 5/6 in many ways. It is incredibly well executed and the theme shines through in the mechanics and cards (although the cubes on a map obviously is quite abstracted). But for me, it just doesn’t sing the tune I’m looking for. The anticlimactic wins were a real bummer for me in some of the games I’ve played – when I felt I had played a great game and I really wanted to see it through. But when the game didn’t end prematurely, I really liked the game. It is tense and exciting to try to decide when to show your hand and go all in for your agenda. The production of the game is cool, the rules are well written and the game comes with a little book with historical context to all the cards (REALLY good idea). Losing and winning prematurely can feel a bit disappointing. The always excellent Bower’s Board Game Corner did a review that gives a nice overview of the game and a nuanced review.